RODNEY DUNN COMPANY, INC., is a full service real estate company located in Temple, Texas, USA. 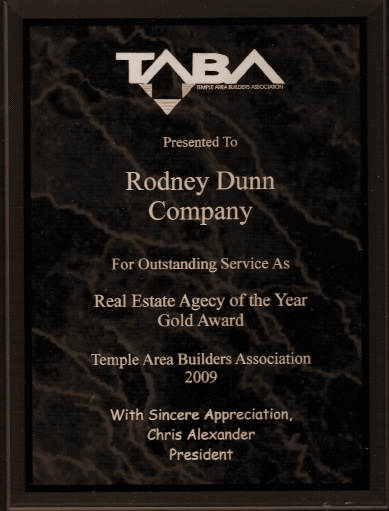 The Rodney Dunn Company, Inc., has historically been the top producing residential real estate company in the Temple-Belton Board of Realtors. 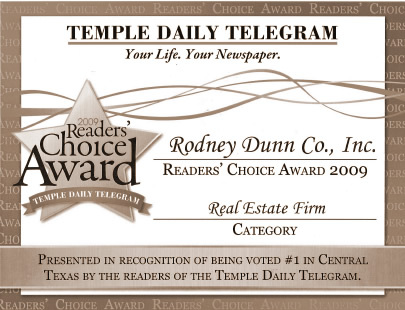 We have consistently been honored as the Temple Daily Telegram's "READER'S CHOICE - Simply the Best Residential Real Estate Agency" and as the Temple Area Builders Association's "Real Estate Agency of the Year." Temple, Texas is located within a few short miles of the actual population center of the State of Texas, therefore, we are honored to represent the true "Heart of Texas!"